You probably wouldn’t want to pat this dog on the head. For a start you’d need to decide which head to pat! Meet Cerberus the three headed dog that, in Greek mythology, guards the gates of the underworld. If you’re a fan of Harry Potter this monster mutt may seem familiar. The character (rather disconcertingly) known as Fluffy, the fierce three-headed dog that guards the magical philosopher’s stone, is based on Cerberus. What are those things? When this painting was first shown, visitors at the exhibition who saw it were terrified, as the images were ‘so awful that the mind shut up with a snap at the sight of them’. Where on earth did Francis Bacon get his gruesome ideas? Apparently he was inspired by some strange sources, including photographs from a medical book about diseases of the mouth, and ectoplasm (which is a kind of horrible gunky liquid produced by ghosts!). Eughhhh! As well as being very scary, the screaming heads look as if they are in agony. The picture was painted towards the end of the Second World War, so the monsters perhaps symbolise the suffering and horror of war. Phew what a relief…some jolly-looking monsters. These creature hybrids are a mix of humans, animals and birds. Can you work out which body bits belong to which species? Karel Appel was a member of CoBrA, a group of artists who were inspired by art made by children. The bright colours and playful style are typical of CoBrA artworks. Appel said that he called the work Hip Hip Hooray because he was so happy that he didn’t have to paint in a boring grown-up style. Tate Kids has invented the name ‘humanimalirdies’ for these creatures (that’s a mix of ‘human’, ‘animal’ and ‘birdies’). Create your own monster mixes and invent names for them. Try out Tate Paint or Street Art. This photograph of a ‘monster’ was taken by artist Eileen Agar at the seaside in Cornwall. Yes, it is a rock – but can you see a monster rabbit lurking in its bumps and lumps? 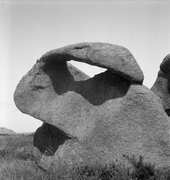 Agar saw strange faces and other bits of body in the shapes of these Cornish seaside rocks, and described them as ‘enormous prehistoric monsters sleeping on the turf above the sea’. She was inspired by the power of nature and loved the fact that these strange monster rocks had been created purely by the forces of water and wind. She also had silly names for them, that described their body-bit shapes such as ’Rockface’ and ‘Bum and Thumb Rock’. Have you ever played that game where you draw a head, fold the paper over so your head drawing is hidden, and then pass the paper on to someone else who draws the body? Did you know that the surrealists invented it? They called the game Le Cadavre Exquis (which is French for The Exquisite Corpse). The Chapman brothers made this artwork together. They drew onto etching plates instead of pieces of paper. They like to use particularly monster-like body parts, like skulls, eyeballs and animal heads. What else can you see in their artwork? Have a go for yourself with your family and friends. Share it with us, we'd love to see your monsters! Quiz: Which Art Monster Are You?